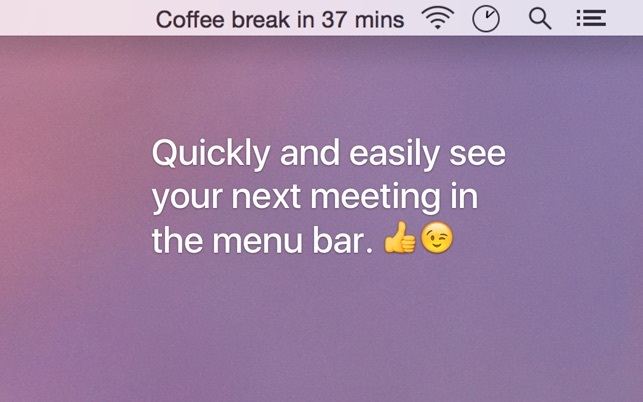 Quickly see your next meeting right in your menu bar with Next Meeting. The meetings come from the built-in macOS Calendar app — so it works with Google, iCloud, Exchange, Facebook, Yahoo, CalDAV, and local calendars. The Join Hangouts keyboard shortcut is now configurable, by popular demand. Visit "Keyboard Shortcuts" to set it up. Don’t understand the two bad reviews as the application does exactly what it says. It displays your next meeting on your menu bar. It is awesome, I love it, and free! Thank you developers of this app. After many failed attempts using Textbar recipes, I was able to get what I wanted and more with this app. The fact that you can click and see the next events is a bonus! This app works exactly as it says it does. While notifications for upcoming meetings are fine, it helps me plan my workday when I can keep an eye on how much time I have until my next meeting. One feature request: any chance a toggle could be added to also display the meeting’s location? This app is fantastic when it works, but occasionally I have to manually quit it and restart it to reflect my calendars accurately- this is problematic because it’ll show meetings that are no longer relevant or not show ones that are important without a manual restart. Probably a current version issue.